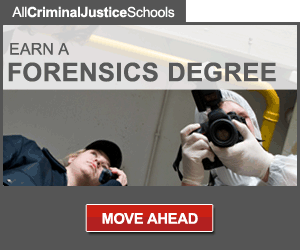 Two typical bloodstains are shown in Figure 1. 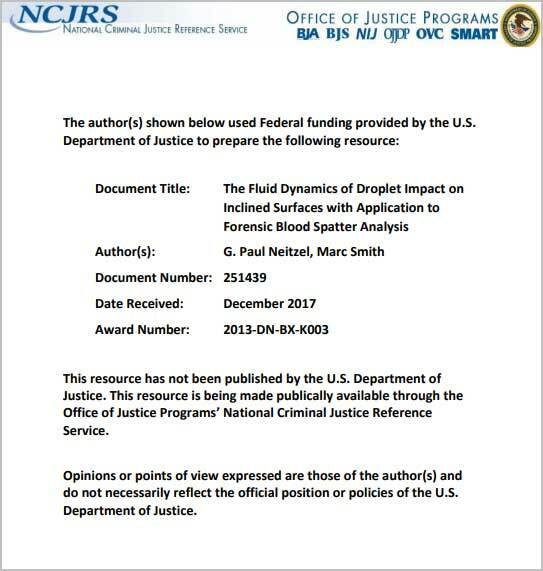 It is known that the size and shape of a bloodstain are caused by some of the physical conditions of the blood droplet at the point and time of impact and the roughness of the impact surface. Stain size is quantitatively described as the area of the stain’s circular or elliptical shape, whereas shape is quantified by the stain’s aspect ratio as well as the number of spines and satellite drops around the stain contour. A spine is a disruption in the smooth periphery of a stain whereas a satellite drop is a small drop that has completely separated from the main droplet and has landed away from the main bloodstain, i.e., a small splash. where the impact angle a is measured from the plane of the impact surface and the width W and the length L of the bloodstain are indicated in the bottom image in Figure 1. Balthazard, Piedelivre, Desoille and DeRobert proposed this relationship in 1939 based on their experimental work, and it has become the predominant correlation in forensics analysis. Using this relationship, a ray is typically drawn in a straight line from the stain in the direction of the angle a. Repeating this process for a large number of individual droplet stains in a blood spatter pattern, the individual rays may converge in a nexus, or region of convergence. The point of origin of the bloodletting event is presumed to be this nexus. 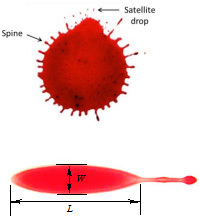 Additionally, under this method the speed of the droplet is determined by the size of the stain and the assumption that the volume of the blood droplet was “normal”, where a “normal” droplet is defined as one containing 0.05 mL of blood. This technique assumes that all stains are created by droplets of equal volume. Recently, more refined methods have been developed in an effort to increase the accuracy of the results. Ballistics software has allowed for a more rigorous application of physics in determining droplet flight paths. Using these tools, gravity, drag, and other forces acting on a droplet in flight may be taken into account. Correlations have also been developed that relate the number of spines to droplet impact speed. With these developments, the assumption of a droplet of “normal” volume is no longer required. Although these methods represent significant improvements over previous methods, they are still limited. A correlation is only valid for impacts within a certain range of impact conditions and for impacts on certain materials. Surface properties such as roughness, stiffness, and porosity affect spreading behavior and can either inhibit or promote spine and satellite formation. 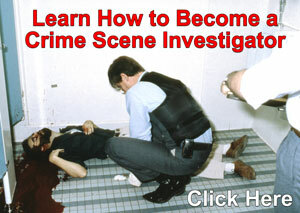 Thus, a more complete examination of the physics of droplet impacts may improve current blood stain examination techniques and lead to less ambiguity in the events surrounding crime-scene blood spatter analysis.